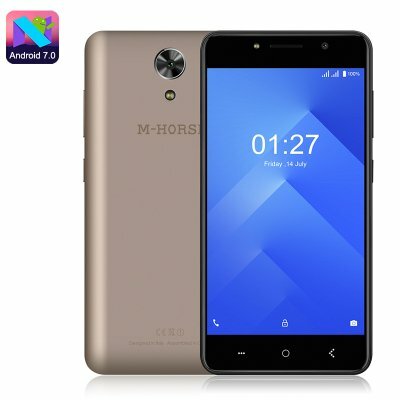 Successfully Added M-Horse Power 1 Smartphone - Quad Core CPU, Android 7.0, 5050mAh Battery, 5 Inch Screen, Dual SIM (Gold) to your Shopping Cart. Named the Power 1 due to its insanely large 5050mAh battery this android phone from M-Horse has enough juice to keep you going days on end without a recharge. It is the perfect phone for those traveling off the beaten path or who don't have time to stop for recharging. The phone has been equipped with an economical processor and along with the smaller than average 5-inch screen it is set up to make the most of the battery and can last several days on a single charge. This may be a cheap phone but it doesn't look it. The bright display has good color reproduction and contrast that ensures videos and games are enjoyable to watch. Covered by a 2.5D curved glass and with narrow side bezels, it looks sleek and stylish. the 16:9 aspect ratio and 67% screen to body ratio makes for a well present phone that's great for use in one hand. The M-Horse Power 1 Andoird smartphone uses a MediaTek 6580A chipset and has a modest 1GB of RAM. however thanks to is Android 7.0 OS it is able to perform remarkably well and is up to tackling all your daily smartphone tasks. With 8GB of internal storage users may want to take advantage of the micro SD slot and add up to 32GB of additional memory space. This should bring you plenty of room for movies, games, music, and apps, as well as any photos you snap from the phones front or rear 5MP cameras.